Amplitude Shift Keying (ASK) or ON-OFF keying(OOK) is the simplest digital modulation technique. In this method, there is only one unit energy carrier and it is switched on or off depending upon the input binary sequence. To transmit symbol ‘0’ , the signal s(t) =0, i.e., no signal is transmitted. The ASK waveform looks like an ON-OFF of the signal. therefore, it is also known as ONP-FF keying (OOK). 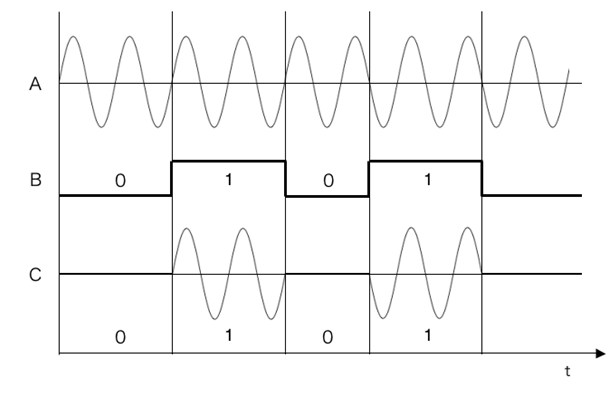 Fig.1 shows the ASK waveform.Here Fig.1 (A) shows the unmodulated carrier wave , Fig.1 (B) shows the input data and Fig.1 (C) shows the ASK waveform. ASK signal may be generated by simply applying the incoming data( represented in unipolar form) and the sinusoidal carrier to the two inputs of a product modulator or balanced modulator. Fig.2 shows the block diagram of a ASK modulator. It consists of the carrier signal generator, the binary sequence from the message signal and the band-limited filter. The carrier generator, sends a continuous high-frequency carrier. The binary sequence from the message signal makes the unipolar input to be either High or Low. The high signal closes the switch, allowing a carrier wave. Hence, the output will be the carrier signal at high input. When there is low input, the switch opens, allowing no voltage to appear. Hence, the output will be low. The band-limiting filter, shapes the pulse depending upon the amplitude and phase characteristics of the band-limiting filter or the pulse-shaping filter. The clock frequency at the transmitter when matches with the clock frequency at the receiver, it is known as a Synchronous method, as the frequency gets synchronized. Otherwise, it is known as Asynchronous. Fig.3 shows the block diagram of asynchronous ASK detector. It consists of a half-wave rectifier, a low pass filter, and a comparator. When the ASK signal pass through the rectifier, we can obtain the positive half wave signal. After that the signal will pass through a low-pass filter and obtain an envelop detection. Then get rid of the DC signal, the digital signal will be recurred. The block diagram of a Synchronous ASK Detector is shown in Fig.4 below. It consists of a Square law detector, low pass filter, a comparator, and a voltage limiter. The ASK modulated input signal is given to the Square law detector.A square law detector is one whose output voltage is proportional to the square of the amplitude modulated input voltage. The low pass filter minimizes the higher frequencies. The comparator and the voltage limiter help to get a clean digital output.